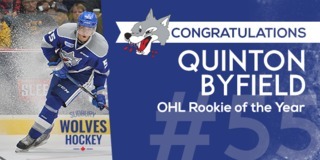 In the final exhibition game of the preseason, and the lone road game, it was the Sudbury Wolves goal scorers who shone Sunday afternoon in Sault Ste. Marie. A total of 12 goals were scored throughout the game, 8 of which came from the Wolves. 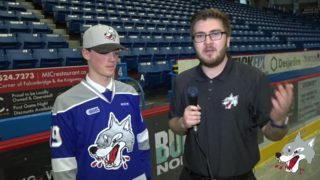 The high flying and gritty game had the Wolves out on top with an 8-4 victory, winning both games of the home-in-home series against the Soo Greyhounds. 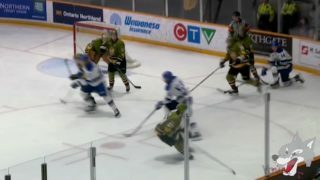 Newcomer and veteran, Kyle Rhodes, scored once for the Wolves during the first period to finish the preseason with three goals. 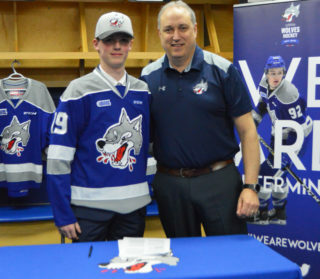 Dawson Baker continued his pre-season dominance as one of the Wolves goal scorers, marking his third goal of the preseason as well. David Levin also had a strong showing picking up two goals and three assists. In the first period, Macauley Carson opened the scoring just 3:53 seconds into the game. It was a two-point game for Carson in his first game back since attending San Jose’s rookie camp, as he also picked up an assist on Baker’s goal in the second. Kyle Rhodes, David Levin, Drake Pilon, and Zack Trott (SOO) all scored in the first period, with the game sitting at 4-1 after 20 minutes. Scoring continued in the second period with Baker, Owen Lane, and Morgan Frost (SOO). The third period had both teams scoring twice with Frost adding his second of the game, followed by goals from Ryan Valentini, Levin, and Barrett Haydon. Other Wolves players who recorded multi-point nights included Michael Pezzetta and Zach Malik, both with two assists. Despite it being early in the season, there was lots of tension between the two squads. A total of 34 penalty minutes and a game misconduct were handed out during the game. Rookie Emmett Serensits and Hayden Verbeek dropped the gloves in the third period resulting in 5-minute majors. Final shots on net were 32-30 in favour of the Wolves. 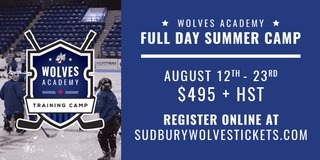 The Wolves will now travel back to prepare for their home opener next Friday night at the Sudbury Arena against the Oshawa Generals. 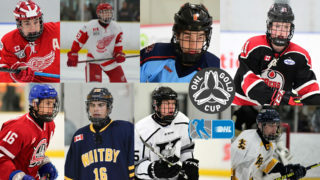 Tickets are on sale at the Sudbury Arena Box Office.